August 11, 2017 // Samantha Boshnack is more than a musician and composer. She is a storyteller who walks us through the history of things. With Nellie Bly Project, she tells the story of daredevil journalist, writer, and feminist Elizabeth Cochran Seaman (1864-1922), known by her pen name, Nellie Bly. The compositions, a four movement suite, are like a journey through the history of the struggles of women throughout American history, a struggle that continues today, and that Boshnack describes as a daily part of her existence. “Feminism is a big issue for me, it’s sort of part of my daily existence, because it’s the struggle. 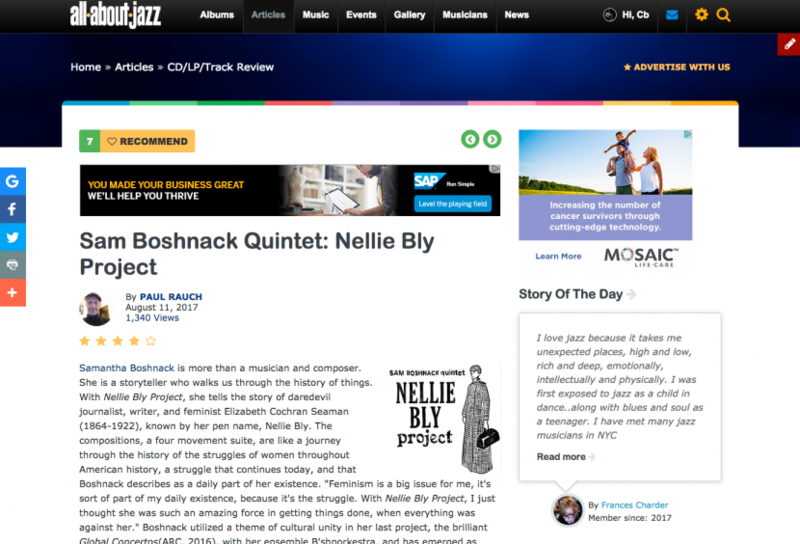 With Nellie Bly Project, I just thought she was such an amazing force in getting things done, when everything was against her.” Boshnack utilized a theme of cultural unity in her last project, the brilliant Global Concertos(ARC, 2016), with her ensemble B’shnorkestra, and has emerged as more than a composer, and trumpeter. Her vision of cultural and sociological unity and justice has established her as a narrative artist with a voice that needs to be heard. “I respect artists, and anybody in the public eye who can come out really strong and say all sorts of things and then take all sorts of abuse. Anybody who says anything gets a lot of attack. I try my best, but I definitely respect those who will really go out on a limb. Global Concertos and Nellie Bly Project were ways to have these activist ideas, but in a subtle way. I think sometimes if it’s subtle, you can get through,” she states. Innocent, unaffected, and frank. These are the words used by Bly to define a “true” woman. In the opening movement of the album, “Expositions,” Boshnack delves into the energy and inspiration that fueled Bly’s activism, in a time when a woman journalist was relegated to topics deemed gender appropriate. After a brief melodic repose to the begin the movement, bassist Isaac Castillo, and drummer Max Wood provide a rollicking groove, underpinned by the keyboard of Alex Chadsey, demonstrating what is to be a recurring theme throughout the album. After progressing to a brief interlude from Wood, Bly’s words, and quotes are used both in a narrative sense, and in the case of this opening movement, in a melodic sense, with vocalists Valerie Holt and Anne Mathews singing in a mantra like chant, “Energy rightly applied, can accomplish anything.” Boshnack has the unique ability to join the worlds of classical composition, and free improvisation, into a sound that views diametric opposites as strengths, and creates a cohesive narrative voice to express a story, to enable a journey. She uses her trumpet and compositional prowess to create a prose that is perhaps more comparable in form to Whitman and Neruda, than to Miles and Diz. Her narrative pieces are like free verse poetry, with angular melodies, unexpected stops, and abstract poetic cadences, that are ultimately impressionistic and expressive. Without this understanding by the listener, along with knowledge of the social narrative expressed, gaining insight and appreciation for this work may be difficult to attain. The second movement, “After One Is In Trouble,” is an homage to Bly’s undercover assignment in 1887, to expose the brutality and neglect at the Women’s Lunatic Asylum on Blackwell Island. Working for Joseph Pulitzer’s newspaper, the New York World, Bly feigned insanity to gain entrance to the asylum, and experience the horror, the abuse of this institution first hand. Her work, later published in book form, brought on major change in how the city of New York defined, diagnosed, and treated insanity. The piece begins with an intertwining melody for Boshnack’s trumpet and the clarinet of Beth Fleenor. It is like a solemn march, ever so slightly increasing in pace and volume, that ends in a pulsing percussive heartbeat supplied by Wood. It is if she has arrived at the asylum, awaiting entrance. A sparse melody, intricate bass line, and Woods’ pulsing rhythm conjures images of a growing madness, as if walking down a hallway through the 19th century asylum, Bly seeing the faces of mad sadness, peering in each doorway and becoming overcome with fear and despair. Chadsey’s keyboard distant rant, then walking bass line picks up the pace, heart racing, body numb, the cold concrete and tile walls reflecting the crying and muttering of pain and anguish, and finally, a release. One can then imagine the music as a survivor’s last chance, of holding on to one last shred of beauty before descending into the abyss of institutional madness, an impulse of hope, renewal, escape, the perception of freedom and joy. The album’s third movement, “72 Days,” depicts Bly’s successful attempt to defeat Jules Verne’s fictional record of “Around the World in 80 days.” Starting with a chanting like vocal and trumpet line stating the above quote, the musical narrative expresses clearly the rhythm of the two modes of transport available to her in this time-railroad and steamship. Chadsey tops off the statement with both written and improvised sections, the latter displaying his stellar playing that is truly evident throughout the recording. The fourth movement, “Legacy,” is Boshnack’s homage and tribute to Bly. It illustrates the remarkable impact Bly has had on modern feminism, nearly a century since her passing, and in particular, how this legacy has drawn such a creative and important work from an artist such as Boshnack. The movement as well presents this quintet as one that has worked extensively with Boshnack, bringing out the nuances of this musical statement with conviction and emotion. The quintet expresses an understanding, and commits to a partnership with the artist to such an extent as to create images that have enduring social impact, within a musical context. Boshnack, both within ensemble playing, and skillful soloing, offers her best playing to date on trumpet, supported strongly by Castillo, Chadsey and Wood. Fleenor, a musical constant in Boshnack’s work in Seattle, plays with unconventional prowess, drawing musical, poetic, and social parallels with the composing artist. The final movement ends on a haunting solo trumpet phrase, that like so many of Boshnack’s pieces, leaves the listener out on the edge, dauntingly lacking finality. It expresses that while much has been accomplished by the feminist movement since the passing of Bly, there is still so much work left to be done. Women still must work twice as hard to gain recognition and attain success, including in the music world. The social narrative to achieve gender equity, is still a story being told loudly, and clearly. The struggle continues, with the courageous activism of Nellie Bly still serving as a beacon of inspiration and persistence to modern “daredevil” artists such as Boshnack. Her ability to create a narrative musically, and truly educate and inspire the listener is rare, and important. It’s part of what makes music a language that unites cultures, and empowers justice.